Pasta alla norma is a traditional Sicilian dish, most popular in the city of Catania, Italy. There are various theories as to its name, meaning "standard or normal pasta" in English. One revolves around playwright Nino Catania Martoglio, who when referring to the quality of the dish and its ingredients, stated "è una norma!". I must give credit to my Italian friend Francesco for creating this recipe, though he refuses to claim it without the essential ingredient of ricotta cheese that is normally present in the dish. 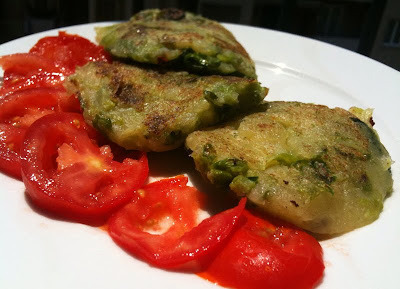 This is a very typical and easy Catalan dish. Escalivar in Catalan means to "cook in hot ashes" and refers to its traditional method of preparation, where it is grilled on an open fire. While this method is still in use, many people now make it in the oven. You can find escalivada in pretty much every bar and restaurant in Catalonia. It is usually served as a tapa on top of bread. Preheat the oven to 500 F (260 C). Brush the whole vegetables with olive oil and set them on an oven tray. Place in oven for 35-40 minutes, turning twice while baking. The vegetables should be charred when you take them out. Let them cool and remove the skin and seeds of all the vegetables. Slice into strips, drizzle with a lot of olive oil and salt and serve. Trinxat, meaning "chopped and shredded" in Catalan, is a potato pancake fried in olive oil. This dish comes from the Pyrenees, where Catalans prepared it for cold winters. In a large pot, boil the chopped potatoes and cabbage for 30 minutes. In a small pan, fry the minced garlic in 1 tbsp olive oil until lightly browned. Strain the potatoes and cabbage in a colander and place them in a large bowl. Mash the potatoes and cabbage with the garlic until smooth. Form the mashed potatoes into patties and fry in a non-stick pan in olive oil until browned on both sides.